The Municipality of Chatham-Kent has declared a state of emergency due to flooding. officials say that an ice jam that formed last night at Lighthouse Cove remains. This is causing water level upstream to rise as the water is having problems pushing through. Water levels along the Thames River downstream of Chatham are very near the top of the flood control works (dykes) in some locations. Surges in water levels have caused slight overtopping in some areas. Leaks have been reported in multiple locations and municipal staff are present and working on emergency repairs. 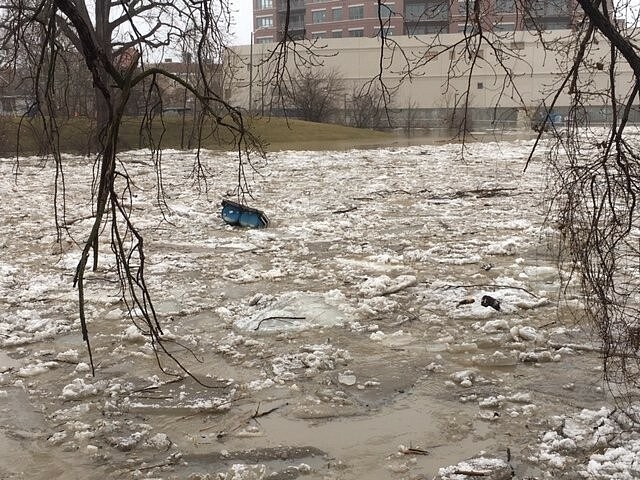 Since the ice jam remains in place and peak flows from upstream have not yet reached the jam area, some water levels can still be expected to rise throughout the day as long as the ice jam holds. Temperatures are well below freezing and expected to remain so through the weekend. If the ice does not move out into the lake shortly, it will likely freeze in place due to the cold temperatures. Residents of Lighthouse Cove and other downstream communities should pay attention to local conditions and watch out for flooding.